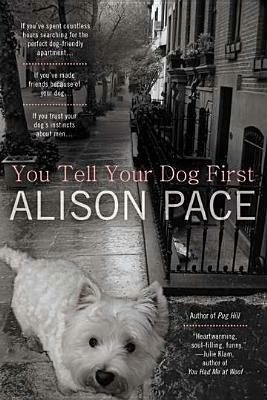 Alison Pace has made a name for herself in the literary world by writing novels that revolve around dogs (my favorites being Pug Hill and A Pug's Tale for the obvious reason that I'm a pug owner). In You Tell Your Dog First, Pace takes her love for dogs and creates a personal series of essays that give her readers a better idea of why dogs are such an important part of her life and writing career. With her trademark wit and humor, Pace not only shows that she gets dogs, but she gets dog-people too. In fact, I think I might be so bold as to call her the quintessential dog-person. Despite her often self-deprecating humor and the assumption she makes that much of what she does for her dog would be considered loony to non-dog-people, Alison comes off as quite reasonable and charming. She is not the dog equivalent to the "crazy cat lady", but you get a small sense that she feels that way about herself . I, however, found her to be quite endearing and amiable, someone everyone would want to be friends with. I didn't look at my boyfriend throughout the meal. Instead of living in the moment, or dealing with the reality of it, I busied myself with thinking about how much worse it could be. I thought: At least my sister isn't picking up Maude and suggesting that everyone pass her around the table. Because, really, she did that sometimes. "Is it time?" I distracted myself imagining Joey saying. "Oh, I think it is!" I imagined my uncle answering her. "Pass the pug!" I could almost hear Nana exclaiming. As I imagined my family clapping rhythmically together, swaying from side to side and passing around a pug, as had happened before, I made it through dinner with my boyfriend sitting across from me, and my parents' Jack Russel terrier sitting happily beside him. I imagined everyone, en masse, bursting into a variation of Pass the Dutchie on the Left-Hand-Side. That never happened, but I imagined it anyway. 1) The association Pace makes with passing a pug around the table and the ridiculous song from the 80s about passing a joint around. 2) My husband and I used to play "pass the pug" when our pug Frank was a puppy to keep him from falling asleep too early and therefore wouldn't sleep through the night, so when I read "pass the pug", I immediately went to my own visions of my husband and I sitting on the couch passing a pug off each other for the better part of an evening. I find Alison Pace's writing both endearing and intellectually stimulating and not just because it's mostly about dogs, but she has a breezy and whimsical style that always challenges my thinking with her word choice and punctuation. There are a few essays in this book that are perfect to share with students when talking about craft. I'm looking forward to using them as mentor texts.